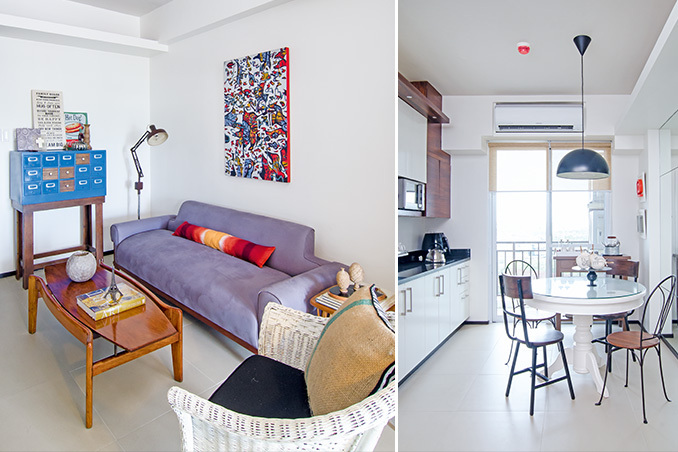 Architect Arlene S. Maslog and her husband bought their condo unit four years ago to serve as their halfway house since it's conveniently located halfway between her kids’ schools and her home in Quezon City. “It was at the height of my daughter’s involvement in gymnastics. She was part of her school’s varsity team, and would come home really late. Having this condo would cut her travel time and ours, too,” says Arlene. By the time they got the unit in June 2013, an unexpected turn of events had happened: her daughter had to move to a new school and stop gymnastics due to an injury. This didn’t faze Arlene since the house still serves the same purpose and also because she already had a peg for the interiors. Coming from a trip to New York, Arlene wanted the space to look and feel like it’s in Manhattan. Challenges aren't new in any endeavor. They couldn’t jump in and decorate because the unit has "madaming kanto." They also had to deal with columns and exposed beams and pipes. Even if they were unprepared for the expenses, Arlene managed to make the best out of the situation and deliver good, solid, and confident design as seen in what she now calls a mid-century modern home. Read the original article ("Home Away from Home") in the March 2014 issue of Real Living Magazine. Download your digital copy of Real Living on the Real Living App now! Log on to summitnewsstand.com.ph/real-living for more details.